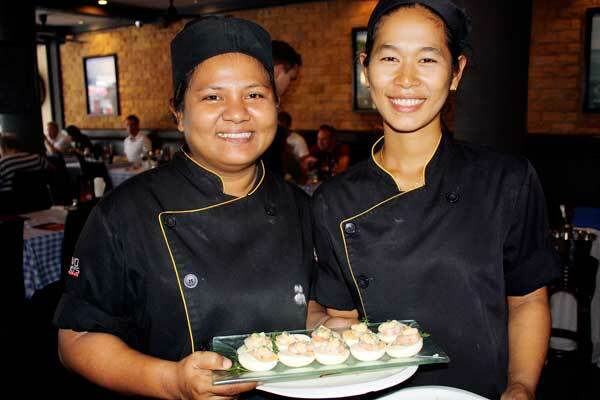 Service comes with a smile at Two Chefs in Kata Centre. Two Chefs Bar & Grill is owned by three friends from Sweden – Krister Westberg, Henrik Ojelind and Billy Agren – and was established 12 years ago. The trio now have three branches, one in Kata central (where the popular Scandinavian-themed Saturday Brunch is held), Kata Beach, and in Karon. The brunch is mainly Nordic, including Swedish meatballs, smoked chicken and salmon (from their own smokehouse), pickled herring, Swedish pancake, Swedish seafood stew, rhubarb pie, Semla (a bun filled with marzipan and cream), and toast skagen (shrimp on sautéd bread), plus a selection of delicious meats, various salmon dishes, potato dishes and freshly baked bread. It is well-priced at B395, and is B695 inclusive of free flow Chang beer or wine.